Other useful places for Deaf and Disabled People’s Organisations to find advice and support. Type of support offered: Improving accessibility of organisation/ services. 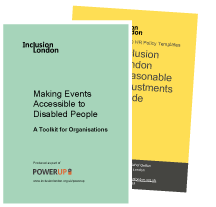 Resources, training and advice on improving accessibility for people with learning difficulties, in services and also within organisations, eg in employment. Cost: Some free resources. Others charged, See website. Type of support offered: Eco audits. Free eco-audits on building and operations to London voluntary sector organisations. Type of support offered: Information on our website on how and where to report disability hate crime, Deaf and Disabled People’s Organisations which offer disability hate crime support, and news and updates about the issue. Type of support offered: Campaigning. Free press release distribution for registered charities.